DartConnect offers multiple options to fit the needs of every event, from a local weekly blind draw, an annual tournament, or a multi-date tour. Regardless of your budget and technology requirements, DartConnect will provide a solution that speeds up match play, captures results and promotes your steel tip event. All events are paid in advance, except for weekly re-occurring events, which are billed monthly. Having a basic understanding of and experience with the scoring application is highly advised before advancing to running an organized competition with Digital Steel. Event deposit is requested. Events are billed after the player count has been reported. Reoccurring may have consolidated billing. * DartConnect recommends including an operator fee with the event service charge to compensate for time and effort required to create darting opportunities. Fully integrated Bracket Program to manage the entire event! SCOTT AND GREGG: This is a VERY rough draft. A sensitive subject needs constant tweaking. Will request feedback after I rework sufficiently, In the meantime, if you think I am missing a theme or major idea, please share. A totally fair question. Many events are run with the goal of breaking even. However, most events have also not raised entry fees in a long time. Of course, when ever there is a price increase, consumers rightly ask “why”? The best answer is because we are going to offer you a better value for your money. The least popular answer: “Because our expenses increased”. To the customer, the experience is the same, but they are actually getting less value. Challenge: You have already promoted your event, very difficult to reduce payout now. Additional Considerations: How important is the amount of the payout in regards to compiling with various accreditation and recruiting participants – especially long distance competitors. DartConnect Position: We appreciate the prestige and the pressure to comply with accreditation requirements. We are not in a position to challenge these expectations. But you are. Have an honest conversation with yourself about what proportion of players are honestly concerned about total payout, high payout, etc. If it is a single digit percentage, it maybe wroth re-considering how you go forward. DC totally supports high level play. Nonetheless, it is the every day player and fan that funds pro level play. We believe that a better experience attracts more players, and this can more than offset any attendance challenges with a reduction in payout at any level. In North America, we regularly receive reports that attendance increases when players learn it is a DartConnect 100% tablet event. Option 2: Add a surcharge to each entry fee. Why give players an opportunity to say the tournament is taking a step back by reducing payouts? This is the most transparent of all options, and has the advantage of placing the justification (blame) for the increase to a third party (DartConnect). However, the customer can clearly see that there are reaching something additional for their money (whether they appreciate it or not, is a different topic), but at least it does not put the event in the light of looking like they are attempting a money grab. Call it the DartConnect Event Fee. They can refer to it as a player tax or something else, but at least they know how the player tax is being spent. Interestingly, the biggest concern we receive regarding this approach is the logistics of maintaining “change” on site, since most North American event entry fees are rounded up to a an increment of “5”. Given that our events are often held at hotels or community centers with bars, we have never seen this become an issue since change is a step away..
Bottom Line: Surcharges are never popular, however they are accepted components of any economy. Energy spikes are the most common example, as they translate to transportation surcharges, but they can appear in food and other commodity prices as well (there is a reason a printed menu says “Market Price”. At least with DCDS, the player gets MORE for their money, as opposed to the SAME. What we like: While it takes a bit of odd armor, remember, it is your event, not theirs. You put a lot of effort into making this come tother. There is no amount of money you collect that justifies the time and effort that you and your staff put into an event. Most players (not all) fail to recognize this, and do not appreciate the sacrifices required to make your event successful. When attempting to justify a price increase, it is easy to fall back on rationalizing the additional expenses an event is insuring as opposed to promoting how much better an event is because of the better value: Better Venue, Cheaper Drinks, Better Experience, etc. As event organizers and risk takers, it is easy to become preoccupied with what we might “lose” as opposed to what we might “gain” by providing a higher value experience. We believe, that in North America, increasing your entry fee for each event by $5, is the preferred approach. Why? This allows you to conduct a one time “band aid rip” that some players will complain about this year, but will disappear in subsequent years. How am I going to justify an increase of $5 per entry fee? That is a fair question. Clearly utilizing DartConnect services does not justify that increases. However it is much better to ask for forgiveness for a single increase, than multiple, consecutive increases. So we encourage you to take a long term, holistic view of where you want the steel tip experience that that you want to provide to your customers to evolve to. Our experience with BOTH events AND leagues, is that when you utilize DartConnect to justify an increase, you are actually providing a tangible benefit that players may not appreciate, but can certainly recognize. When a venue increases the cost of a beer by $.50 or a hotel room by $5.00, consumers naturally complain that they are getting the “SAME” for “LESS’. But with DartConnect, they are definitely getting something “MORE” – anyone can argue the value, but you cannot debate that it is “more”. Goose The Payout! Wether you reward the elite, or spread the wealth to all levels of competition, give back to those who make your event happen! Tablet Rentals: In North America, rent tablets from either the DC or the the ADO to cover every board. Outside of North America? We are looking for ambassadors that can help spread the word and become regional experts. Provide an additional service/benefit: Tap into your imagination and determine what you have always wanted to do to make your event distinct, but have never thought players would appreciate. Blame it on DartConnect, while improving the player experience and making your event distinctive. Up to 64 Dart Boards can Feature DartConnect! DartConnect can provide 32 rental tablets and mounting hardware. Tablets are available on a first come, first serve basis and should be reserved early to ensure the lowest cost shipping option. All tablet rental and transportation fees must be pre-paid and are non-refundable. To reduce your shipping expense, DartConnect may forward the shipping cases to a different address than the origin. The tournament is responsible for inventory counts and any items damaged or lost during the event. * Shipping estimates assume UPS ground rates.If DartConnect is sending a representative, excess bag and overweight bag fees may apply. Gear bag may include support gear such as large display screens (Nabi Tablets), display hardware, tripods, display equipment, banners, etc. Is Your Event Sanctioned by the ADO? Your Event Is Eligible to Rent an Additional 32 Tablets! Sanctioned tournaments are eligible to rent the ADO’s 32 tablet. Theses tablets may be used in separately or in conjunction with DartConnect’s Tablets. The ADO tablets are available at the same rate, terms and conditions as the DartConnect tablets. Tablet rental shipping and fees are all prepaid, and non-refundable. For North American Events, DartConnect has the ability to provide on-site support for a limited number of events each year. 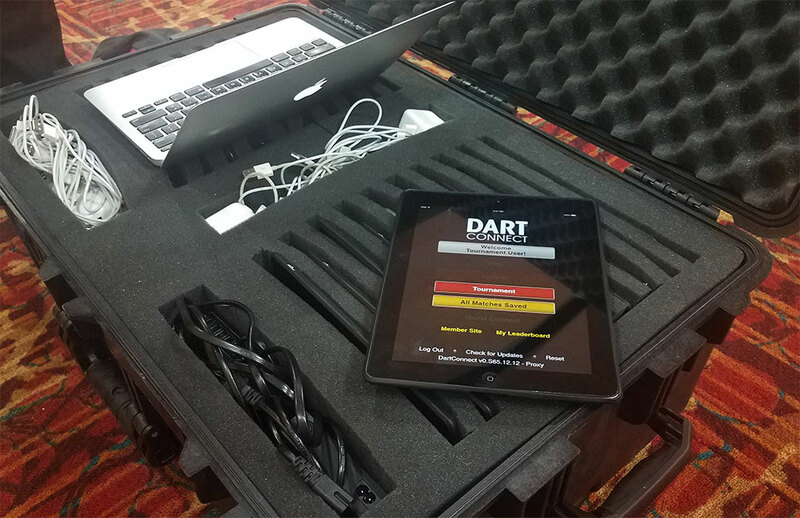 While the tournament staff is expected to run the event using the Digital Steel Platform, DartConnect representatives, will be available for tablet set up, on site training, trouble shooting wifi, etc. Criteria for attendance include the staff’s familiarity with the scoring application, the venue’s wifi capability and local support from area leagues and clubs. In addition, DartConnect provides training software that enables staff to practice setting up a draw and running a bracket. In addition we recommend running a small local event to gain first hand experience. Lodging: Event is expected to provide lodging for the duration of the event. Travel options may require the representative to extend lodging before or after the event. Transportation Cost: Travel expense is the responsibility of the event. For first time events, DartConnect may absorb some of the expense, based on the size and location of the event. Meals and Stipend: For 2019, DartConnect waives these expenses. The event is expected to provide lodging for the duration of the event. Travel options may require the representative to extend lodging before or after the event. Travel expense is the responsibility of the event. For first time events, DartConnect may absorb some of the expense, based on the size and location of the event. For 2019, DartConnect waives these expenses. Promote like a pro with DartConnect’s Custom Marketing Services. Our access to the wider world of darts can be leveraged to make sure everyone knows about your event! We offer personal consultation to define your marketing goals and how to achieve them. Are you serious about promoting your event or tour? DartConnect can put together a proposal to create a custom marketing plan to recruit attendance, highlight players and promote sponsors and partners. Our solutions begin at $5 (USD) per attendee. Contact us for a custom quote, that will give you access to over 50,000 players and hundreds of thousands of fans every month.